Some patients with proliferative diabetic retinopathy develop scar tissue on the surface of the retina that contracts and detaches the retina causing severe, often permanent, vision loss. 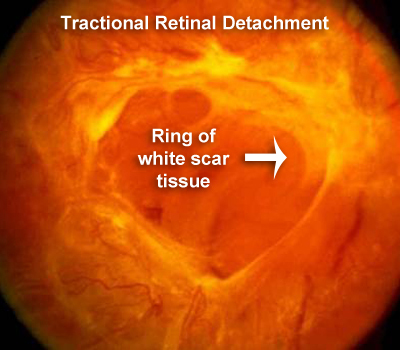 What is a Tractional Retinal Detachment? 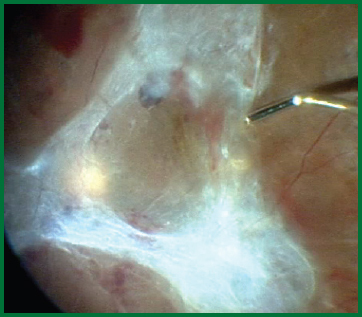 Diabetic tractional retinal detachment is the most advanced form of diabetic retinal disease. "Tractional" means that there is pulling on the retinal surface and "retinal detachment" means that the pulling is strong enough to separate the light-sensing retina from the back of the eye. The traction in diabetic eye disease comes from extensive growth of abnormal blood vessels in proliferative diabetic retinopathy. The abnormal blood vessels grow from the damaged vasculature of the retina into the jelly of the eye called the vitreous. The vitreous acts as a builder's scaffold or as empty framework for the vessels to grow into. As these blood vessels grow into the jelly they become denser and mature into membranes of fibrous scar tissue. Eventually, the scar tissue contracts and the pulling from this detaches the retina. Sometimes, the stress on the retina is so great that tears or holes are formed. How is tractional detachment Treated? 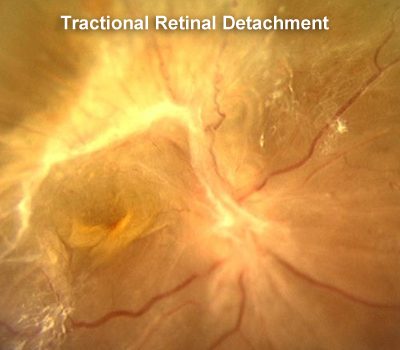 Sometimes a tractional retinal detachment can be stopped before it affects the central vision. A small area of retinal detachment far from the center of the vision can sometimes be watched if it stops growing due to laser or injection treatment and improvement in blood sugars control. Other times, a tractional retinal detachment affects the central vision significantly enough to require surgical repair. The surgery performed is called a vitrectomy, or removal of the jelly in the back of the eye that the abnormal vessels are growing into. In this diagnosis, vitrectomy is also combined with careful microscopic dissection of the fibrous scars left by the abnormal blood vessels from the surface of the retina. Laser is often performed simultaneously to reduce the risk of the vessels recurring or to treat stretch holes in the retina. To help keep the retina reattached, the eye is sometimes filled with a synthetic gas or silicone oil at the end of the repair. Oftentimes, the decision to use one of those materials as a vitreous substitute is made during the surgery. Although the eye is often red after surgery there is usually not much discomfort. Typically, patients leave the operating room with an eye patch and return to the office the next day for post-operative evaluation and removal of the patch. Scratchiness or a "sandy feeling" is common for a few days, and eyedrops are started the first day after the procedure. Visual recovery is slow following repair of diabetic tractional detachment, and, although vision very rarely returns to normal following diabetic tractional detachment, there is usually visual improvement after surgery. As with any interventional procedure, there are risks to vitrectomy for diabetic tractional detachment, and about 20 percent of the time, there is loss of vision despite the best attempts to repair the retina. Every diabetic tractional detachment is different, and a surgical plan is tailored to every case. The specific risks and benefits of the procedure will be discussed with each patient on an individualized basis. 62 year old man with recurrent vitreous hemorrhages from the traction around the macula and adjacent to the optic nerve. This video shows removal of the blood, release of the vitreoretinal traction, removal of the scar tissue and then laser. An air bubble was used at the conclusion of the case. The patient did very well and regained nearly normal vision within about a month of surgery.